On the way to the wedding we passed by the property of the church that Joel Coronado attends in California, Calvary Wildwood. This is the home of their future Sanctuary. Like Eder says "they are Wild at Wildwood". Wild for Jesus! This Saturday in Oak Glen California, Pastor Tom's niece Breanna got married. It was a beautiful ceremony; only one problem, it rained. Not the whole time, actually the Lord is so good. When the ceremony started the rain stopped. Afterwards it started again. Hannah led in worship when the bride came down the isle. It was a beautiful ceremony. The amazing Eder; just to throw a shout out for our brother. He has been in Okinawa for just under 1 year and he has lost an amazing 40 pounds (around 20 kilos). That is incredible, that healthy Okinawan eating is really paying off. Great job Eder. Keep on training. Just taking some time to think back and reflect on the things the Lord has been doing at CCGinowan and CCBC Okinawa. It is amazing to see how the Lord continues to bring new people into the ministry. This semester we have seen the arrival of Chuck and Yumi Robb, David Redondo and the return of Robert (Vunder) Wunderlich. We are so blessed to have these people with us and not to forget the new Japanese people that the Lord continues to bring to the fellowship. We have seen new growth in the area of the church as well as spiritual growth in the people of God. I am continued to be amazed at the teaching of Pastor Tim as he gets smoother in his delivery and study of the Word of God on Sundays. 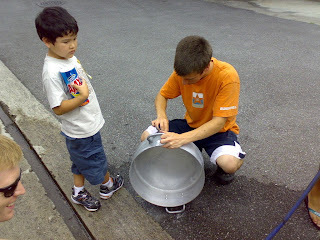 Andrew Neely is growing in his teaching and we have experienced such wonderful teachings in the Japanese language too. How fast time is going as this August will mark 5 full years in Okinawa Japan! Wow! Things have sure flown by. "Thank you Lord for the wonderful people we have had the opportunity to minister to and along side of. Lord we look forward to who You will bring in the future as we see the vision of reaching the Okinawan Japanese people fullfilled before our eyes. Lord please continue to work in the lives of the people in the Church as well as the Bible College and the continued new students that You will bring. Be Glorified Lord, we love You. In Jesus Name, Amen." Today the Ruiz family are heading back to California for the Pastor's conference, to visit family and share the Word at a few of our close churches. Pastor Tommy will be also teaching at CCWilliamsburg in Virginia as Joanna and Hannah will be teaching at a Women's and Young Girl's Conference. It will be a busy time in Cali, please pray for the Ruiz family. Thursday's are always special at the Koinonia Cafe, why? Pancakes for breakfast! This week we had a lot of left overs, so the gals were doing a little experimentation. Peanut butter jelly pancakes. I caught them in the act and I had to take a picture, those cakes look good! God bless you girls. Ahhhh to be in love. Isn't it great to see this happy couple. God continues to prepare them as they seek the Lord concerning the marriage date. 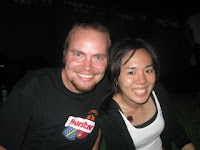 Please keep Andrew and Kayo in your prayers, God has great things in store for this wonderful couple. Good things do come to those who do their homework. At the Biblical Preaching Class for the Summer interns and Missionaries we are going over the basics on how to prepare for a Biblical Devotion. Since they do not have a grade to work at, somehow we have to modivate them to do ALL their homework. So for those who do thier homework, we have a special prize for them them; Ice Cream! Everyone love ice cream. Monday is our day off here at CCGinowan so we all headed out to Kadena Marina for some relaxing time in the Son. I thought that it would be cool to feature some of the couples in the pictures this time. They had a lot of fun paddling around and goofing off. It was a relaxing day in Jesus. One last question: "Hey, where is Masaki?" You only have one First Anniversary, so Rusty and Amber celebrated it here in Okinawa. Joanna and Hannah baked this PacMan cake for this couple. For those of you who do not know, Amber and Rusty met as the result of a video game (too long to explain, you can ask them later) so the girls thought it would be perfect to make them this cake. God bless you Spearman's and Happy Anniversary! Please leave them an Anniversary greeting below. God is still in the business of doing miracles! Meet Hitomisan, about 6 or 7 months ago the doctors diagnosed her that her baby would be born with severe handicaps and recommended ending the pregnancy. She was greatly disturbed and asked Andrew to pray for her. She came to church and we laid hands on her believing that the Lord would heal her baby. Well little Tasuku was born 2 months ago a perfectly healthy baby boy! So beautiful, the picture does capture how cute this little guy is. Praise the Lord for His miracle work! We had some good bands come out and minister at Mihama this Saturday night. We had a lot of fruit for the night. It is always amazing to see the Worship of God draw the people to come and hear the Gospel message shared one on one. Please continue to pray for us that the Lord will give us vision for outreaching. 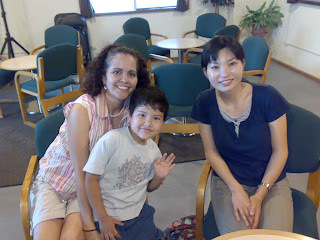 Here is Asa pictured with the only two teachers he has ever had; Mom and Reina sensie. Reina is Asa's first grade teacher. It is kind of cool here in Okinawa Japan. The teacher comes and visits at the house of all their first grade students. She came to the Koinonia cafe to meet Joanna and I and tell us how Asa is doing. She says that Asa is doing well, some of the Japanse food he does not like for lunch but he is learning well. His Japanese is definitely getting better. Praise the Lord for His Grace. The Lord recently blessed us with two used pots for cooking. We purchased this smaller wok and this cool large one. Both of these pots are commercial grade and would be totally out of our price range if we had to buy them brand new. Growing up in the restaurant business I can spot these expensive commercial tools and then "let the bargaining begin". They needed to be scrubbed down but then "whalla" they are brand new. Just to get an idea of how much these pots cost brand new, the one that Dean is cleaning would start anywhere between $200 and $300 dollars. The best thing about these cooking tools they will last forever (if you take good care of them). These older pots are better than brand new ones because they are made out of better and thicker aluminum. Well, that is your cooking utensil lesson for the week. Thank you Lord for your blessings! 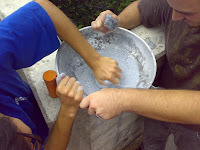 And thank you guys for all the "elbow grease". Today is Irma's Birthday, so we took a trip to the Ondish restaurant in Urasoe City. We had a great time eating dinner. God bless you Irma, and Happy Birthday. Please leave Irma a Birthday greeting below. Sosimo loves mirrors. In fact he cannot pass by one without looking at it. So when he sees this blog he is going to ask self "Why didn't they put that in when I was there". Well Sosimo, we keep making improvements to the Koinonia Cafe, sorry this one was not made while you were here. God bless you bro, doesn't Joel look good? 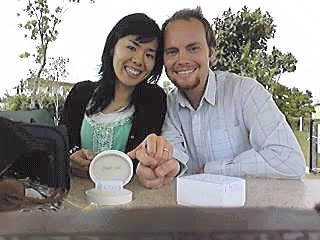 Andrew and Kayo are Engaged! Praise the Lord! You heard it first here on e3missions. They have talked to their families made the announcement at church and now it is officially on the site. Andrew is a wonderful guy and Kayo is an incredible gal. We know that God has great things in store for them both. Please leave them an engagement greeting below. Yumi is blessing the students by taking the time to teach us during the summer. 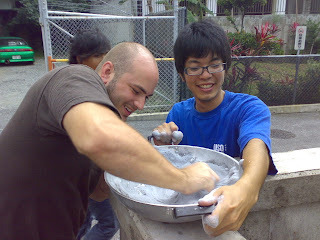 We need to sharpen our skills in Japanese so all the Bible College Students and interns are taking Japanese II. "Lord, help us to learn Japanese better to communicate with our brothers and sisters at their level, in Jesus Name we pray, Amen". Some of the students will be heading out to Korea soon to help Pastor Mike at CCDaejeon. So Chuck is helping the students out in the basics of Korean. It seems like the students are liking it. Even those who are not heading out to Korea are getting into the action. Thanks a lot Chuck for teaching us. We had a great time the afternoon that Kelsi left for home. She was able to have one last bash with us at the beach. We headed out to Toguchi Beach for a Paddleboard Outing. She is incredible, check her out, she is a natural out there. We love you Kelsi and we are truly going to miss you here in Okinawa. This semester is different than all the others in that normally there are only two who stay back, but this time only two are leaving. Melissa is heading back to Norco California. She will be attending the campus in Italy next semester. Melissa was a blessing to everyone at the campus, her positive attitude kept everyone in high spirits. We love you Melissa, and we already miss you so much. w2 was an incredible evening, we were so blessed with the teaching of Andrew in Japanese and Tom translating into English. It is really a blessing to see the guys stepping out in faith. Everyone was encouraged, edified and enriched. Sunday after Church we had a "going away" potluck for the Barrios family. Afterwards we prayed for them and David shared with us some good words. It is amazing how many people come to Okinawa and meet the Lord, growing in a personal relationship with Him. The Barrios Family and so special to all of us, we are going to miss them. We love you guys! Please leave a farewell comment below for this special family. David and Liz helped lead in worship for last time before they head back to the states. We are going to miss this family, they mean so much to all of us. God bless you Barrios Family. May the Lord continue to lead, guide and direct your steps.